I think by now you’ll all have noticed I have a habit of taking ages to get round to doing things. Just like the last Vegan In Scotland review – The Chocolate Tree, my new favourite place on Earth – I was aware of Bread Street Brasserie‘s vegan evenings for months before I actually booked a table there to see what the fuss was about. It’s thanks to your suggestions on Twitter that I discovered this place, btw, so feel free to always message me any vegetarian/vegan (friendly) place you’d like me to check out! I took an open-minded omnivore friend of mine to dinner at Bread Street Brasserie, all the better to get a well-rounded opinion for my review. BSB doesn’t usually do vegan food, only for this monthly event, and I think it’s important in a non-vegan world that we are able to cater enjoyable plant-based meals to both vegans and omnivores alike – to me, that’s a pretty decent scenario. It felt quite luxurious to be sitting down on a Thursday night in BSB’s glamorous 50s-60s decorated restaurant. A waiter promptly introduced herself to us and helped us identify the vegan wines (!) on the menu. There was brown bread to nibble on, too – a European touch I very much appreciated. 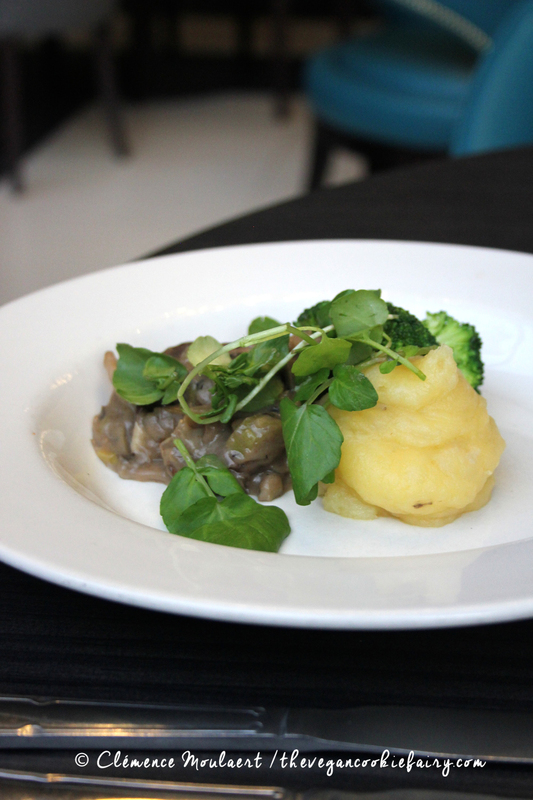 For each vegan evening they host, BSB creates a three course menu with three different choices for each course. It’s been chilly in Edinburgh, and neither my table companion nor I felt like having anything other than the nettle soup for starters – we direly needed something to warm us up. The soup arrived just moments later, and it sure warmed us up – plenty of pepper will do that for you. We dropped a small dollop of margarine into our bowls to soften the sharpness of the soup, after which it was perfectly fine. Continuing with our comfort food theme, we then ordered a leek and mushroom pie for my friend and for me steamed ‘cheesy’ cauliflower on a bed of radish and samphire. Again the food was served without delay and our friendly waitress was always around to top up drinks and check on us. My friend was rather surprised at her ‘pie’ – apparently a euphemism for stroganoff and mashed potato – but enjoyed it nonetheless; my cauliflower and samphire dish could not have been more perfect. The chef did a brilliant job with these seasonal ingredients, and turned them into a deeply satisfying meal. We have a massive sweet tooth, my friend and I, so expectations were high for dessert. The quinoa and banana pudding piqued her interest, while I, predictably, went for the chocolate lava cake. Sadly the pudding turned out to be a small mound of butterscotch mashed banana and quinoa – which tastes as unappetizing as it sounds – and my lava cake was a raw concoction with delicious chocolate cream inside – but not a lava cake, really. But it was as rich and moreish as I could have hoped for, and if I hadn’t been so full already, I would have eaten ever last crumb. In conclusion, a bit hit and miss. Not bad at all, especially for a restaurant that does not usually serve only plant-based meals, and for such an upmarket place the bill came to a reasonable £22 for each of us, wine included. (The set menu for the night was £17.5, drinks not included). We left feeling full and nourished, and happy for having tried something new. It certainly did not put off my friend, which is always a plus when introducing vegan food to an omnivore! In hindsight, I also realised my entire meal was gluten-free, save for the bread. Disclaimer: This post was not sponsored by Bread Street Brasserie and none of the food was complimentary. All opinions are my own and that of my table companion.